Based on our sales charts, customer reviews, buying patterns and historical data, we at CompAndSave.com have concluded that the HP 564XL Ink Cartridge is our best-selling, and most popular, replacement ink cartridge on the market. The reasons for this remarkable success is the fact that they can work with several different models of printers and are known to offer excellent results, including good quality printing and long lasting monetary value. CompAndSave.com charges only $52.11 on Combo pack of 9 x HP 564XL ink cartridges! In a market segment that is sensitively priced to the extreme, we find that one of the main reasons for the unparalleled success of this ink cartridge is its price point. 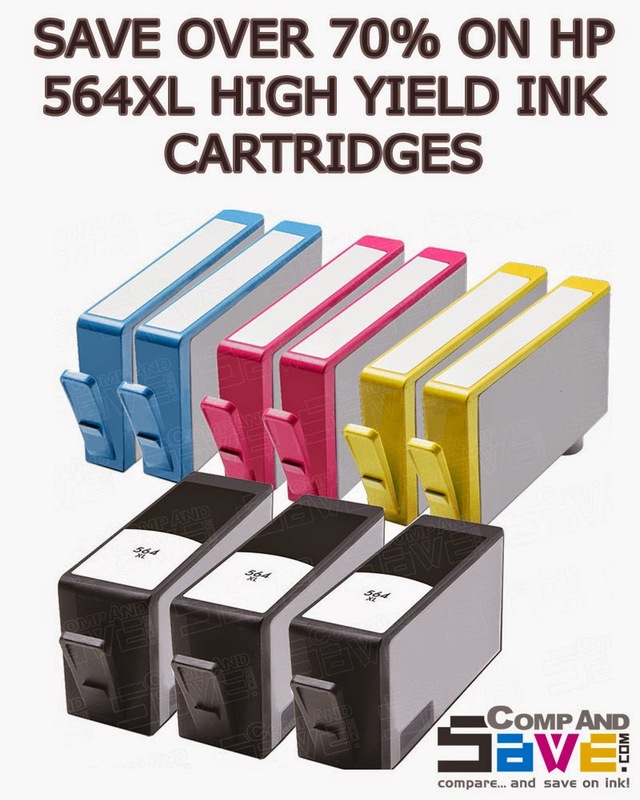 If you view our Price Comparison Chart, you will see that you can enjoy savings of up to 73% on the Hewlett Packard HP 564XL (Combo Pack of 9) High Yield Replacement Ink Cartridges (3 Black, 2 Cyan, 2 Magenta, 2 Yellow). The brand-name price of HP 564 ink combo pack is $191.91, while it retails between $123 to $133 at popular computer accessories outlets, such as Staples, Walmart, etc... So as you can see, the price advantage is a huge tipping point that makes so many of our customers favor this ink cartridge from CompAndSave.com. Besides saving up to 80% on all printer supplies, our free returns within 10 days if you are not 100% satisfied with your purchase is another reason why our customers prefer buying from us over and over again. We are so confident of the quality and performance of our replacement products for printers such as HP, Epson, Brother, Canon, Lexmark, Dell, Kodak and many more, that we are able to offer this type of after sales assurance. Less than 24 hours order processing and shipping is also another aspect that our customers love about us; and in case you are not aware of it, you should know that all order values of $50 and above, qualify for free shipping automatically. So no wonder we enjoy over 99% customer satisfaction! You simply have to read the user reviews on the product pages to know how happy our customers are. Don’t forget that combo packs let you save more when shopping at CompAndSave.com. As long as you keep the package closed, our products have a long shelf life, and there is nothing wrong with stocking up your ink cartridges. From time to time, we also offer our customers HP ink coupons and other discount vouchers to further sweeten the deal. To receive those exclusive offers, you should subscribe to our newsletter. Other ways to keep track of store events, discount vouchers and promotional coupons on ink & toner cartridges is to follow our blog and Twitter page , or like us on Facebook . Stay connected with us and has access to all of our special discount offer and Ink-citing giveaways!